I’ve been doing pretty well in the 3 weeks since I officially began ‘The Project’, even with the biological clock drama (you can read more about that craziness here: http://wp.me/p32wA4-1C) . I’ve been eating fairly well, getting enough sleep, talking to my body every day and trying to do something creative daily as well. It’s been easy enough thus far, so I thought I should challenge myself. This week, the goal is to eat really well and by that I mean NO JUNK FOOD! At all. Not even dark chocolate. I’m not a junk food junkie, I don’t even like most candy or sweets, but I definitely love chocolate, ice cream and lately I’ve been indulging in quite a few gluten-free cookies. I wasn’t a cookie person at all back in the day, but I guess not eating them for years and then finding seriously delicious gluten-free ones unleashed the cookie monster in me. I’m making this harder on myself. Now I want cookies. I was doing so well today too. Anyway. NO COOKIES for Kacie. I just need a little break. It’s not you cookies, it’s me. I just need a little time to get my head together, you know? We’re not breaking up, I just need a little space. (You do look so lovely tonight though, I must say). I am planning on gorging myself on whole, clean foods to fill the cookie shaped hole in my soul. I’m going to stay as far away from refined sugar as I can get, and really limit processed foods. 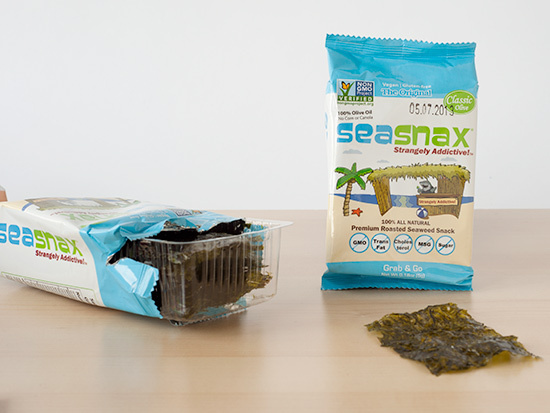 When I’m snacky, I’ll just have to survive with my Sea Snax. They are strangely addictive, and a fantastic chip replacement. I used to be a potato chip fiend, and I find I can’t enjoy them in moderation, I just have to stay away. One handful leads to a whole bag in a day or two so I can’t buy them and keep them at home. These Sea snacks taste exactly like the Nori on sushi, yet have a very satisfying salty crispness to them. So, good luck to me! This will definitely be one of the harder things I’ve put myself up to. The no-drinking thing is going surprisingly well. I think having food poisoning and puking up the last glass of wine I had made it oh so much easier to go without. I’m off to have some Sea Snax while I watch Star Trek: The Next Generation on Netflick and doodle. A wild Monday, for sure! I’ll leave you with a dance…. This is how I spent part of this afternoon, just rocking out in my living room, with a hoop.